I’ve made a few prints of this cover in Bucktown, Chicago. 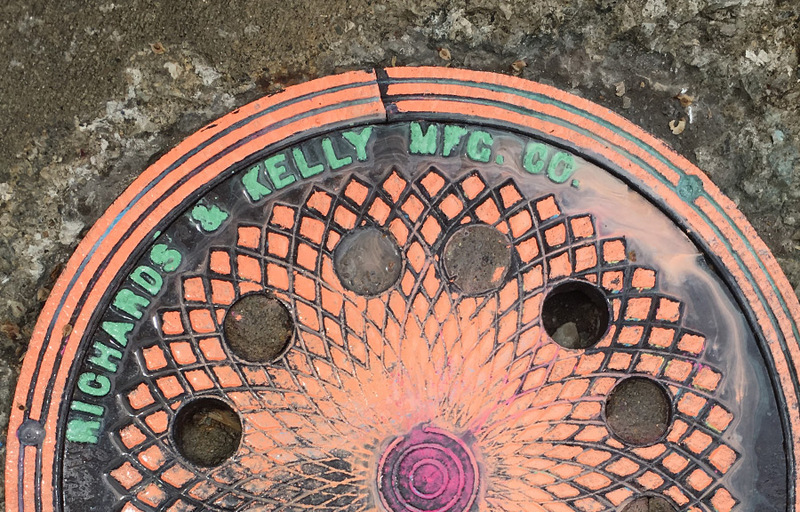 I believe it’s an old coal hole cover dating back to the late 1800s to early 1900s and it reads “Richards & Kelly Co. Chicago, Illinois.” The small circles would have been glass inserts allowing the light to shine down into the basement when closed. They’re all gone now, mostly filled in with concrete. The first time I was painting this piece of iron, a local walked over to see what was going on. Turns out he's been living across the street for the past 40 years. His name is Richard and he gives me a rundown of the neighborhood. What’s now a public path was once the railroad that carried goods out of the neighborhood. There were machine shops, factories, and small apartment buildings for the workers. The business owners lived just south in the larger buildings around Wicker Park. The building we were standing in front of went through many phases. It was once Richards & Kelly Manufacturing before becoming a local watering hole named Richard’s Tavern. So I end up making a print from a Richard’s and Kelly coal hole cover (possibly produced feet just feet away) that was in front of Richard’s Tavern – and met a man named Richard. Best part - that was the first time he ever noticed the cover in the 40 years he’d spent walking that sidewalk. This past Spring, I went back and printed it 4 times on the same piece of canvas. After exploring colors and compositions, I chose what you see here. 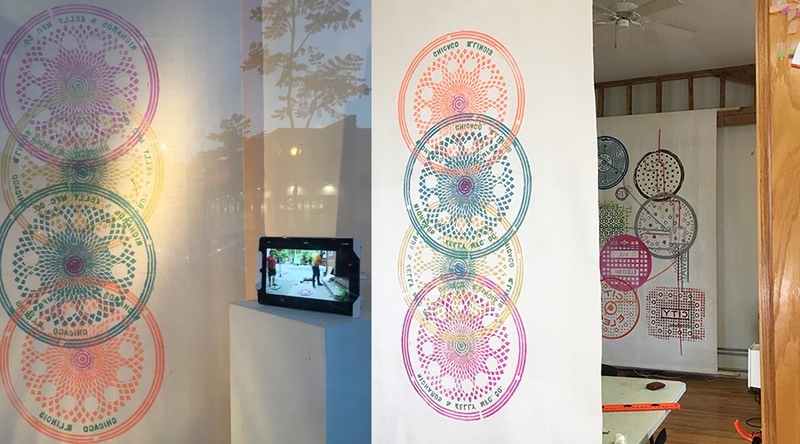 This piece was part of the "One Wall" exhibit at the Jackson Junge Gallery in Chicago. 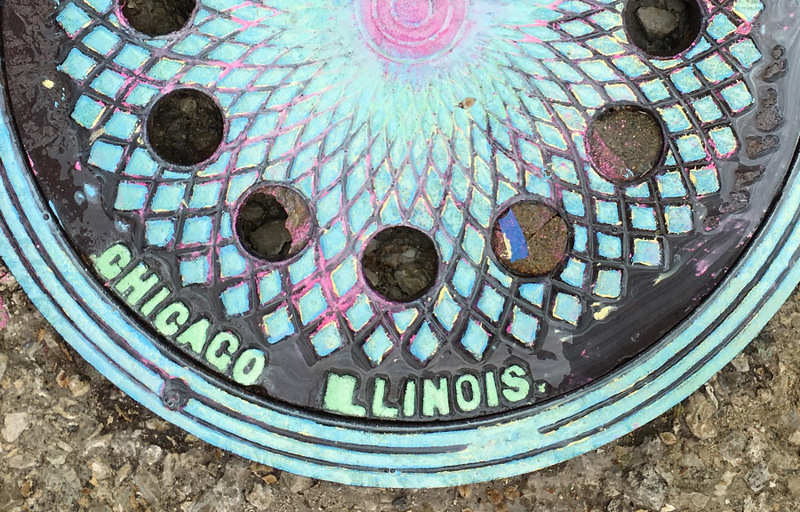 Original Artwork made directly from utility covers in Chicago, IL.